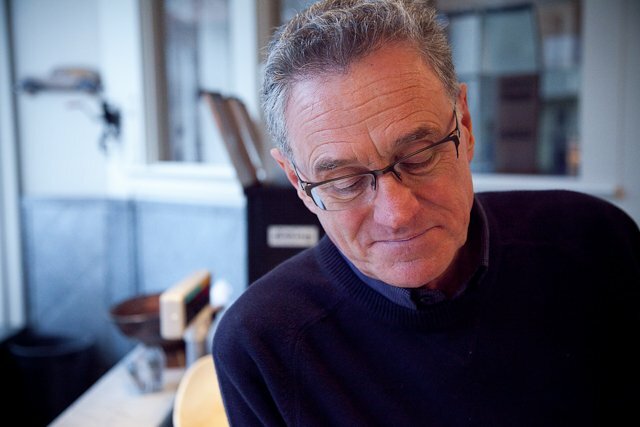 14 February, 2011: Luciano Repetto: Graffeo Coffee Roasting Co.
San Francisco. 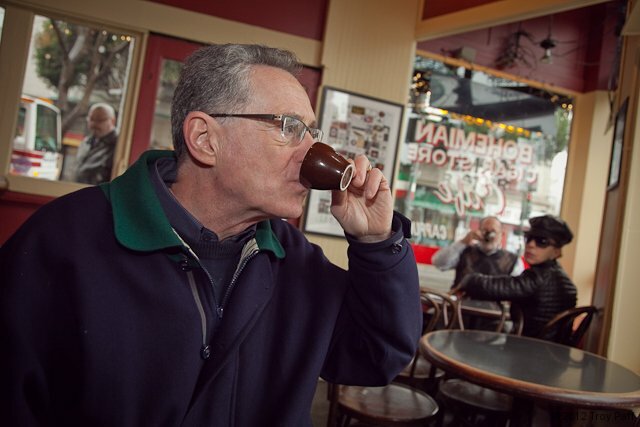 Of my predilections, I suppose this is true: I am a coffee snob. While I am not proud of this admission, I too often find myself in nebbish conversations about the black stuff, and the qualities separating the good versus bad. Convenience versus craft, diner versus hotel, drip versus instant, espresso versus French press, black versus the über sweet concoctions rolling off the Starbucks assembly lines coast to coast. A dissertation on the minutiae would not be lost on me, or out of the question for this modest blog. 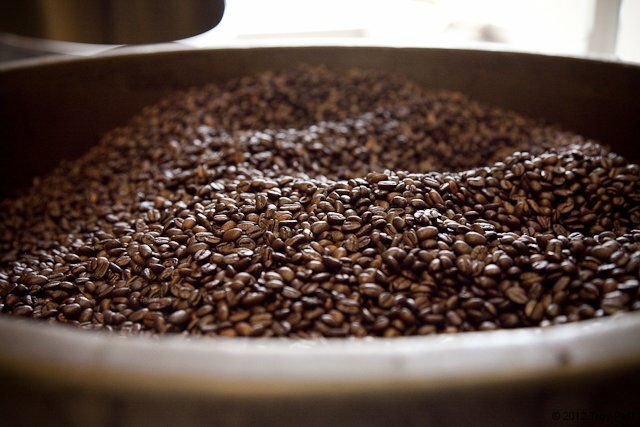 Besides evolving my craft as a home barista, over the years I’ve begun roasting my own coffee beans. Because I am a coffee snob, seeking out the best commercial roaster I can find perhaps makes less sense for TJP than it does for my own edification. 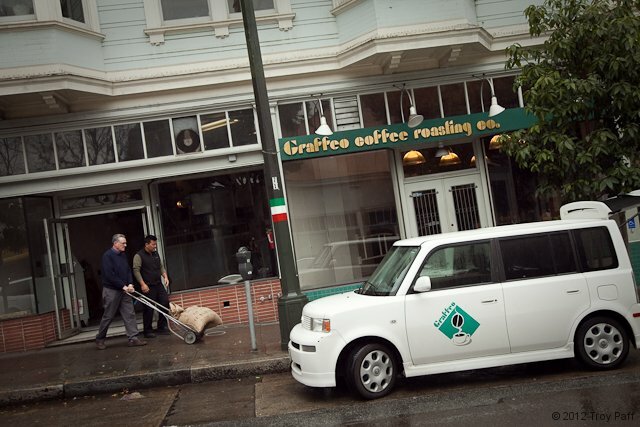 This is why I’m paying a visit to Graffeo Coffee Roasters in San Francisco, more precisely in the old world neighborhood of North Beach aka Little Italy. I discovered North Beach in the mid nineties, while visiting a friend in San Francisco. What began as a day of exploring the city proper by lunchtime had become a fixation on the burgh: Cafe Trieste and other sidewalk cafes, cozy old bars with slices of virtuous pizza, basement record stores hawking stacks of vintage stereo gear, the landmark City Lights Books. By evening we were a couple Irish coffees in and strolling the steep avenues to Coit Tower, puffing Nat Shermans and enjoying the nighttime view over the Bay. A decade later, I find myself in North Beach on a somewhat regular basis. Being that a particular Dirty Jobs host lives in San Francisco, we are often shooting segments in and around the city. When we are, the crew takes up residence on Broadway, where Chinatown holds hands with North Beach in an eclectic union of culinary opportunity that we adore. 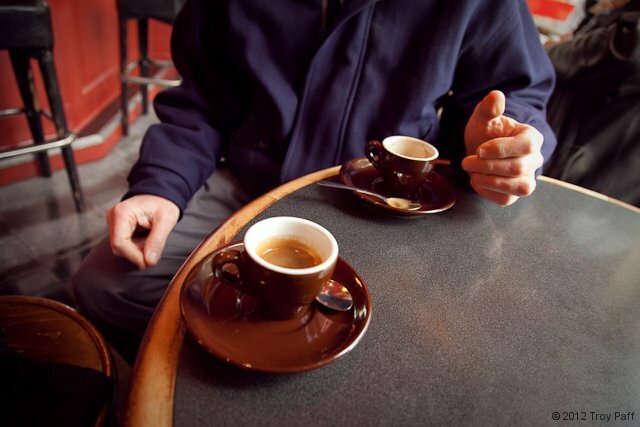 In six years we’ve made some favorite haunts for noodles, pasta, tapas, beer, wine … And coffee. More than a decade later, I still recall the unfolding of that brown bag, and the token act of putting my nose inside for the ‘whiff’ of what would I figured would be some good stuff. But this was a special. 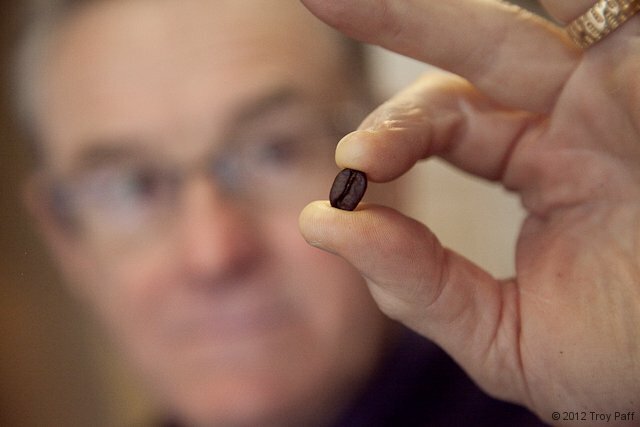 There was a deep robustness here, yet no smokiness or acidity typical of “freshly roasted” beans. It was as if the oils were alive in the air without the sensation of assault. On the contrary, the subtle sweetness that lingered in the nostrils soothed in a way that contradicts a caffeine infusion. I am honest when I say I’ve yet to find this sensation with another roast. At the time, my barista skills were virginal. I spent what I thought was a lot of money on a used DeLonghi Sorrento, a passive, entry level espresso machine with a steam wand for frothing milk. Despite chopping my beans to dust in a $20 nut grinder (a connoisseur’s no-no) , the Graffeo roast produced a tasty espresso and an Americano on par with a fine French press coffee. I would not improve upon this combo until I later upgraded my knowledge and equipment. But more on that in a future post. As my snobbery has grown, Doug and I have continued to pick up fresh roast for each other when visits to the Bay area permit, with the locale in SF/North Beach usually more convenient than the San Rafael one. 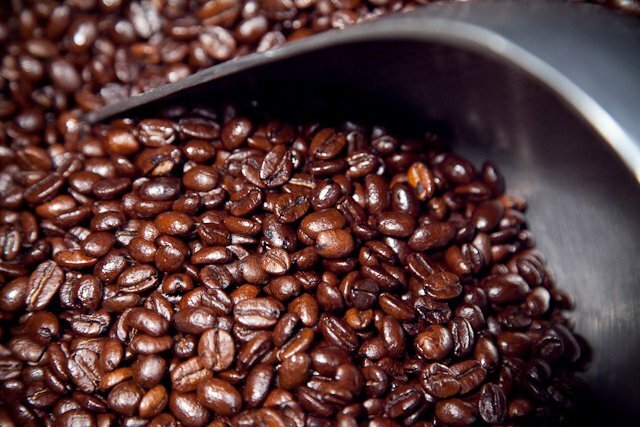 As my skill as a barista has advanced and my attention to refinement has evolved, I’ve held Graffeo as the gold standard of superlative beans, expertly roasted. 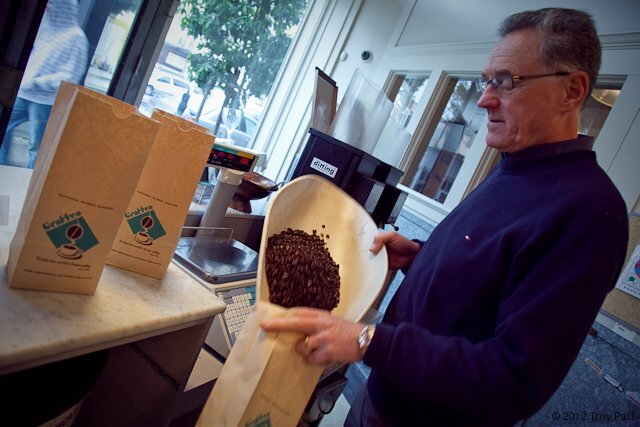 To date, few roasters (Intelligentsia, Blue Bottle) have consistently offered this snob such inspired roasts, prompting the question: What is Graffeo’s secret? 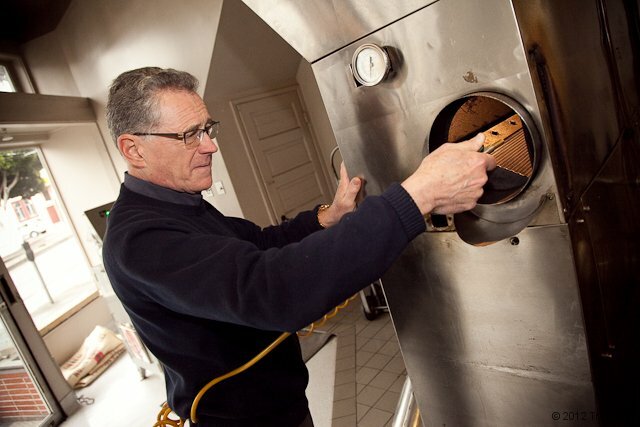 Already Luciano is heading through the adjoining room, where his shop manager is filling retail bags of fresh roast from a 50-gallon trash can of dark, oily beans, toward another room full of shiny machinery. I pause momentarily, long enough to drink in the aroma of all the beans and to ponder the surface area of fresh roast filling my nostrils. 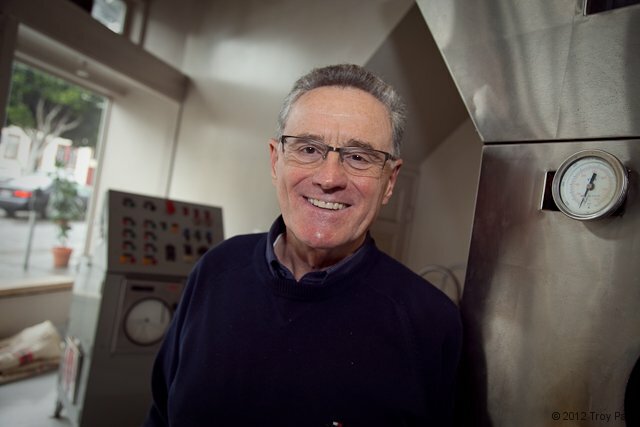 By the time I catch up to Luciano, he’s pressing a button on the control panel of a massive stainless steel contraption, and it whirs to life with a rush of air and rattle of what I presume is coffee beans inside. 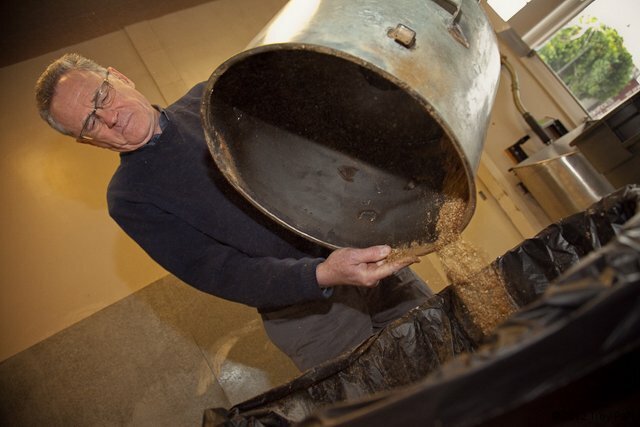 He steps aside, and from what I can gather, we are witnessing the creation of another batch of product. 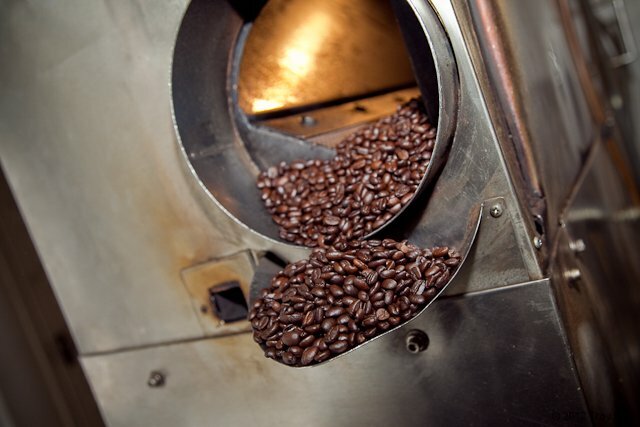 After a couple of minutes, he opens a porthole so I can see the innards at work: airborne beans bathed in a warm orange glow, always in agitation to prevent burning against the steel walls of the roaster. The cacophony of the process has rendered communication impossible, but I do my best to follow along. 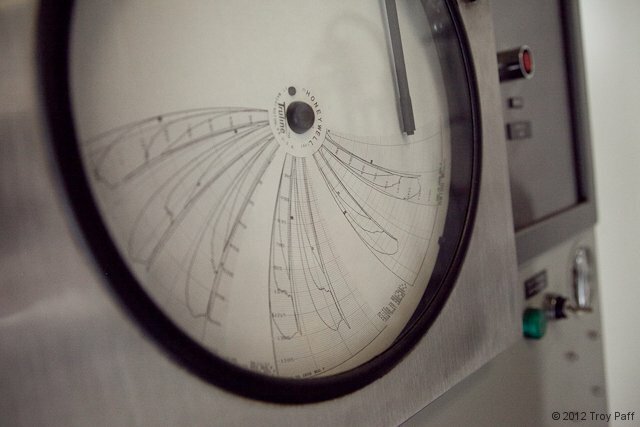 Luciano points out a kiosk-like apparatus that is plotting lines onto a disk of paper. It looks like something Cal Tech would use to monitor earth movement, but what it’s really doing is tracking temperature change over time. 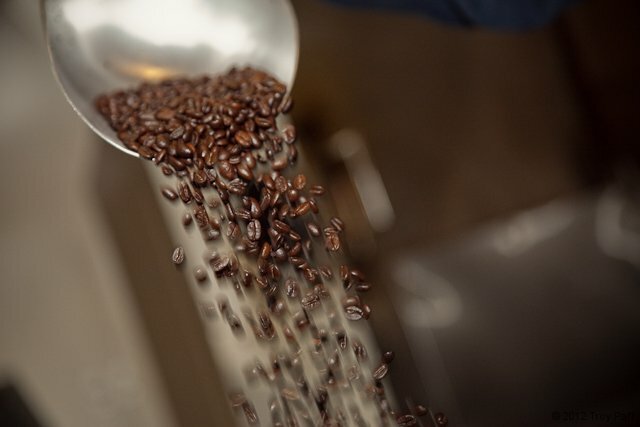 This is vital to the process, as evidenced by the rapid cooling phase whereby the heat is cut and the chamber blasted with fresh air to stop the roasting as quickly as possible. 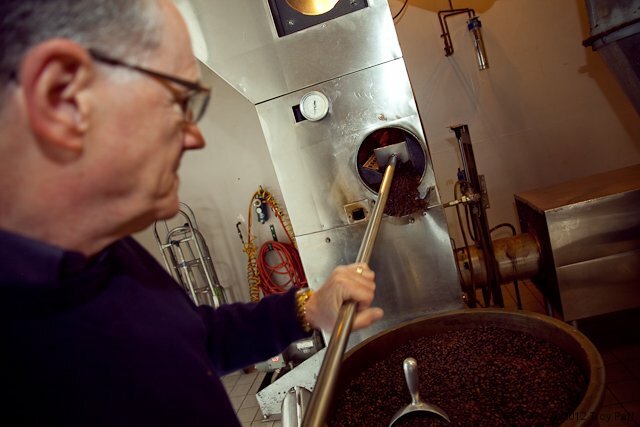 A moment later, Luciano is emptying the beans from a hatch and into a trash barrel, filling the room with a blast of rich, roasted aroma. The machine goes quiet. He gestures to the bounty. Though I don’t grasp the significance of this quite yet, I do understand that this is big information and I’d best pay attention. By the way, it is interesting that there is no smoke after such a violent, hot process. Luciano has just left the room, pushing the can before him. I catch up. “And that’s it,” he says. He nods to the bagging operation still in process. Done? I laugh. It’s really all I can do. 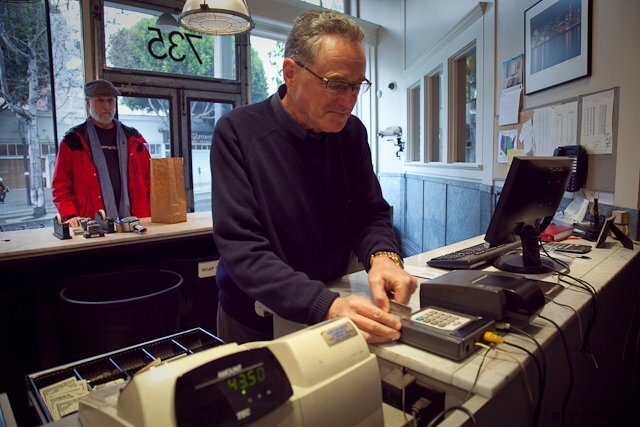 The front bell rings, and Luciano returns to the retail desk to assist a customer. 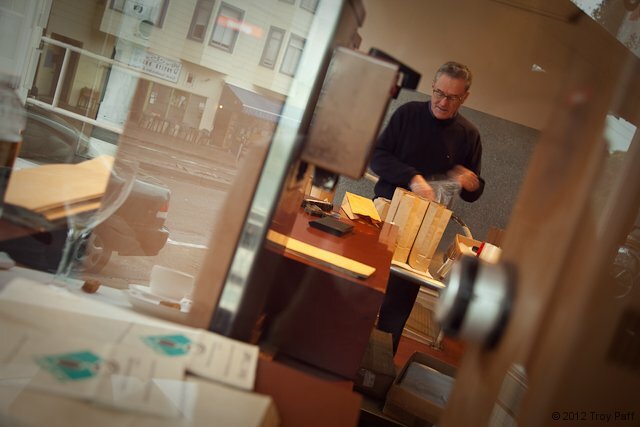 The shop manager, hard at work filling mail and website orders, offers me a knowing smile. When Luciano returns, I’ve got my camera set up and I’m shooting the beans, the glorious beans. The shop manager is grinning. Luciano caves. “Okay, okay,” he says. 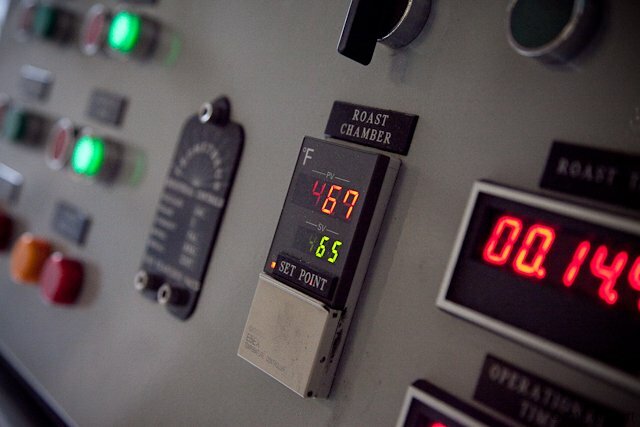 We’re back in the roast room. Satisfied that I do, in fact, care about this process, Luciano has shifted gears. He has slowed down, resigned to an obligation that we now share. 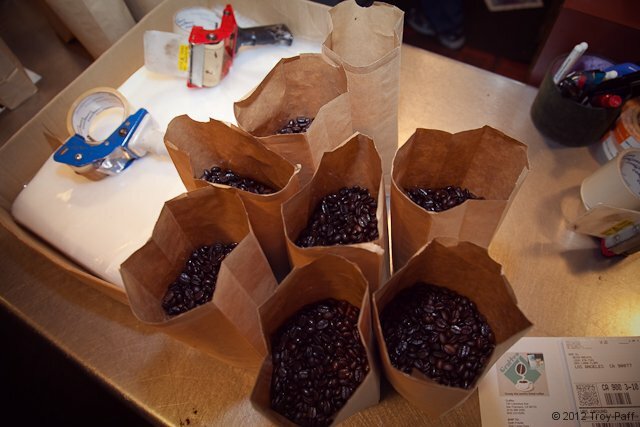 We begin by doing a second round of dark roast, preceded by a dry run without power or heat. 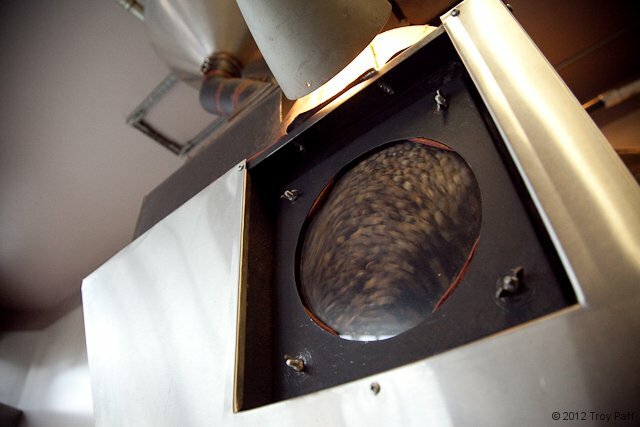 Luciano’s baby, aka the Grand Apparatus, is a fluid bed roaster of 15 years age, one of a handful of such machines in existence, designed and built to spec by coffee roasting luminary Mike Sivetz of Corvalis, Oregon. 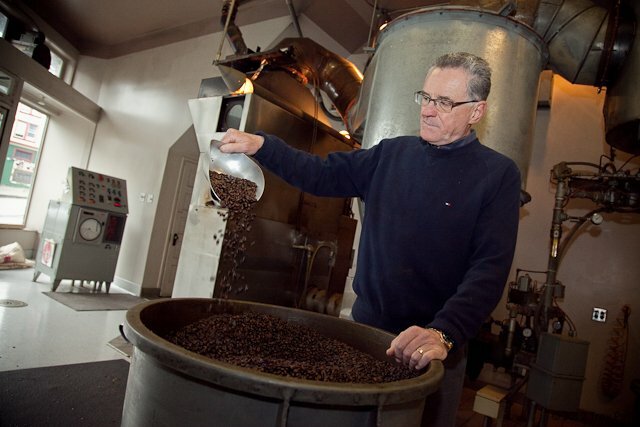 Mr. Sivetz is a retired chemical engineer and “the world’s leading authority on coffee roasting.” Even in his 80’s, Mr. Sivetz continues to experiment and refine the principles he and Luciano hold as vital to proper roasting: Complete temperature control of the bean, right up to the ‘set point’ (or target temperature) of the roast; an effective arrest of the roasting process, followed by immediate cooling; and, inclusive to the preceding steps, continuous ventilation throughout the process. A roast in its essential form should not be smoky. 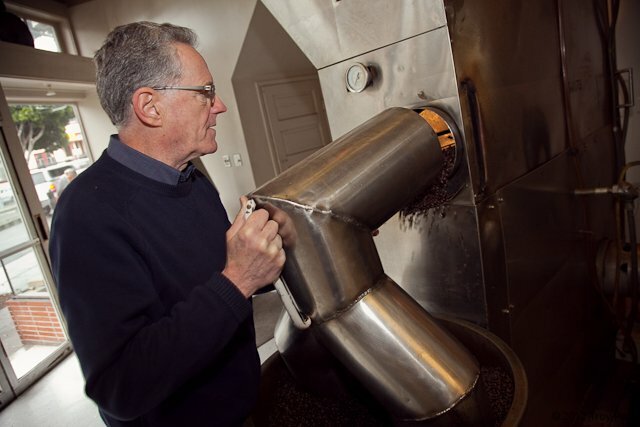 (At the risk of compromising your coffee cred, don’t tell Luciano you like a smoky roast.) Besides a smoky environment, killers of quality include less-than-spotless equipment and inaccurate gauges for monitoring and controlling temperature. As I become acquainted with Luciano and his ethic, I realize that his pointed answers are less a result of surliness and due more to what I’m growing to appreciate in every professional I meet who is at the top of their game: unadorned conviction. Patience is a virtue that becomes less useful to the practiced; expediency is golden. For artisans like Luciano, my presence represents a distraction that, until I prove myself worthy of higher wisdom, is mere nuisance. Even at the age of 66, Luciano has no plans for his own retirement. “I don’t know what I’d do with my time.” Especially where refinement takes time, and time is a commodity not to be squandered. Upgrades are key, in both tech and know-how. 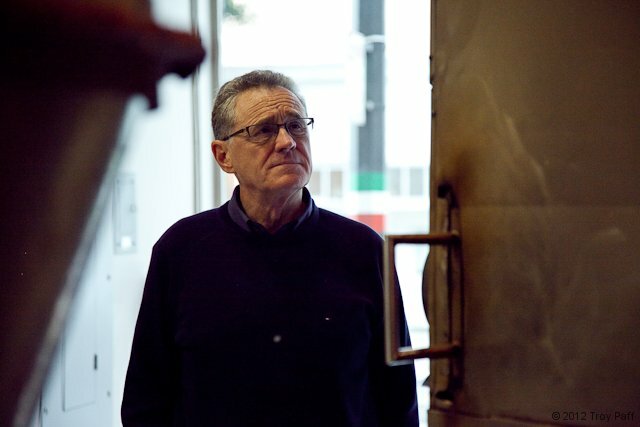 Walking back into the shop, Luciano pauses at the old roaster in the window. “Otherwise you may as well use a nut roaster in your kitchen,” I say. 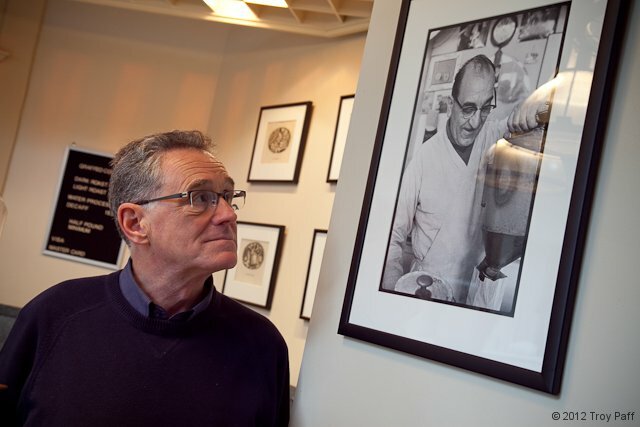 In memory of Michael Sivetz, 1922-2012. I regret not making it to Corvalis in time. This entry was posted in Portraits, Tradesmen and tagged Coffee Roaster, Graffeo Coffee Roasting, Journeyman Project, Luciano Repetto, Troy Paff. Bookmark the permalink. 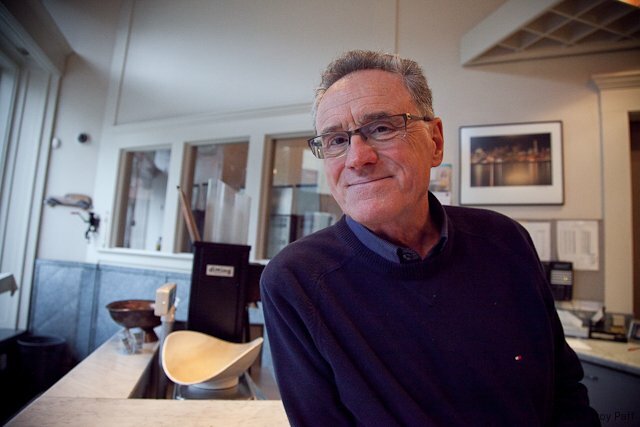 Lou has been a friend and client since he took over from his father. I enjoined your description of dealing with Lou. We met because I had my office across the street and Geovanni would wave at me in the afternoon to come over and have an espresso he had just made. Roasting was done on the two pound roadster that was in the window of the bagging room. 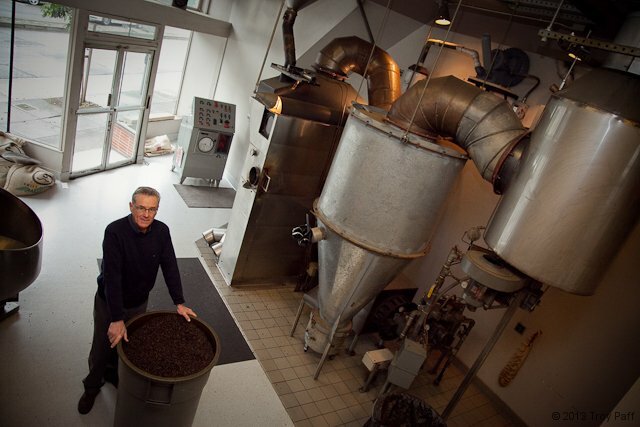 When Lou took over he wanted to expand and develop an image of quality gourmet coffee. I designed the logo, packaging and stores. The theme was to be a modern view of North Beach and old San Francisco. The window art was my vision of coffee at breakfast and dinner at a fine Italian restaurant, the objects are twice size. The morning sun has not treated them well. 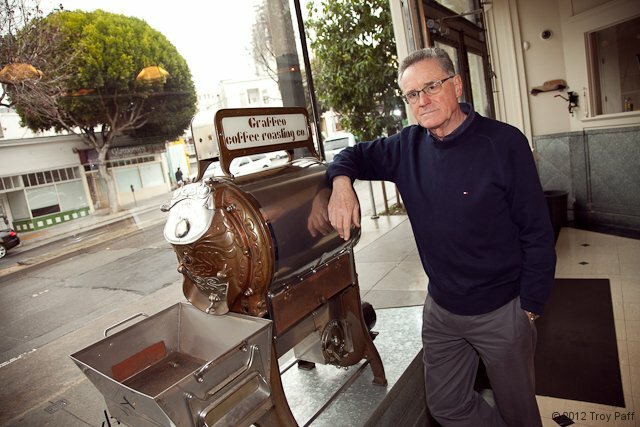 About 1962 I discovered Graffeo Coffee & Signore (Don) B. Repetto who invited me for an ‘old school/ stovetop’ espresso, an event that turned into a wonderful ongoing experience, each time a lecture-story as the old roasting &/or mixing machine was always running. 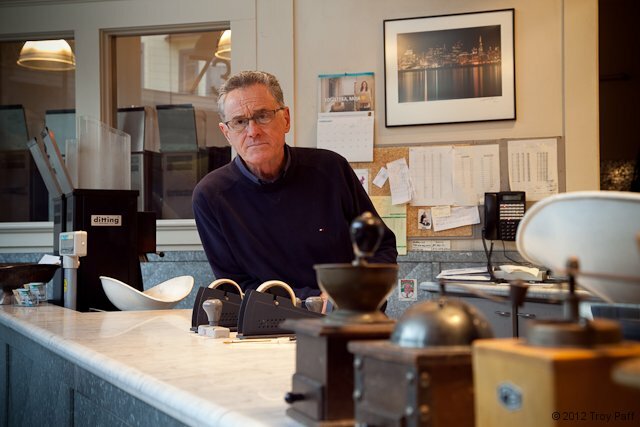 A few years later as a Berkeley student I met Alfred Peet who continued my coffee education & largely seconded all that I had learned from the Don. Some 40 years later in Trieste I met Alessandro Hausbrandt grandson of the founder of quality coffee in Italy under the Hapsburg empire. Alessandro basically reconfirmed everything I had learned about coffee from my two coffee gurus. Thus a half century ago my coffee journey began in Frisco’s Northbeach Little Italy & finally arrived in Italy to the source.